Well, Winter is on the way out, but still not done with us. We got a nice warm spell early in this period and I planted more things at both gardens. 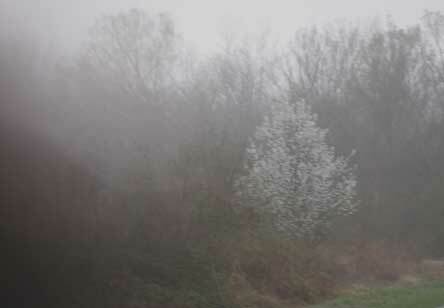 Then the cold came back and my walks on the 17th and 19th at Shelby Bottoms were cold and foggy. 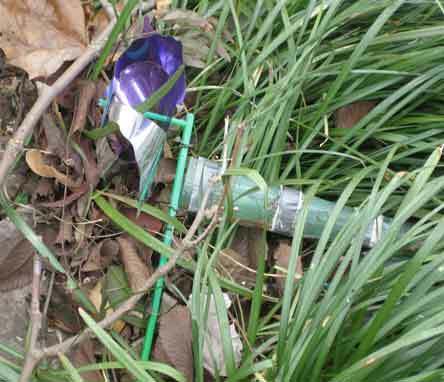 Nature abhors a vaccuum they say. Well, so do I. So I filled in the empty spots at Travis' garden. 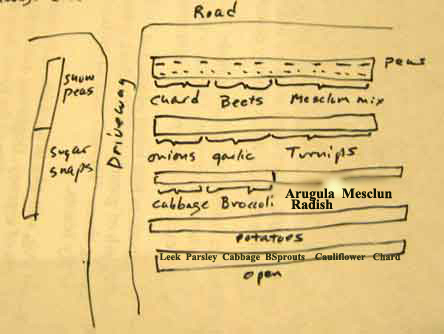 The arugula, mesclun, and radish on row 3 and the leeks, parsley, cabbage, brussel sprouts, cauliflower, and chard are new on row 5. Tuesday morning at SB and the heavy fog makes a ring around the moon. 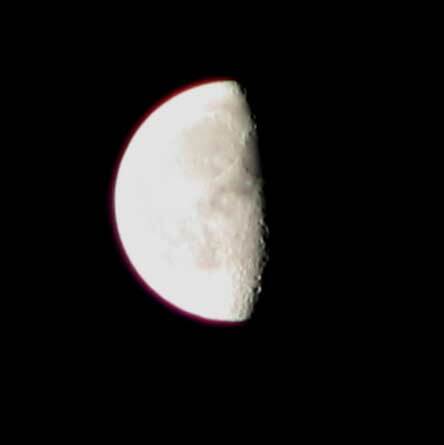 The Canon 10X does a pretty good job if you can brace it on something.  I almost missed the two deer in the big field near the pavillion. On my way back it was a little lighter, but the fog was still heavy. 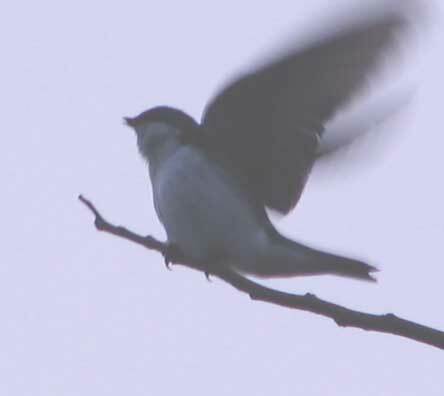 The first tree swallow I've seen was revving up his engines to keep warm. It was a real treat to see this flowering tree. Pear? 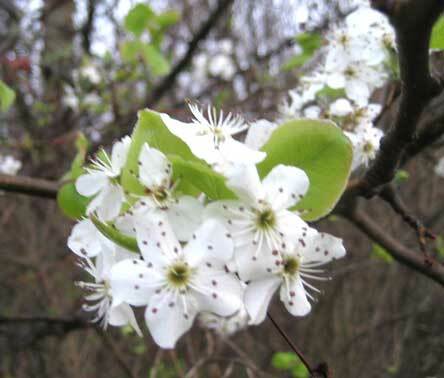 or maybe crabapple? Whatever it is the blossoms are really nice. Sure sign of spring. 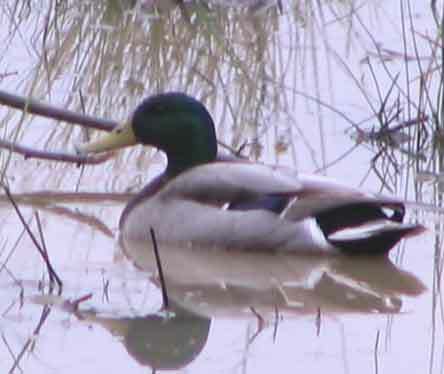 This mallard is still hanging around, but will probably head north soon. 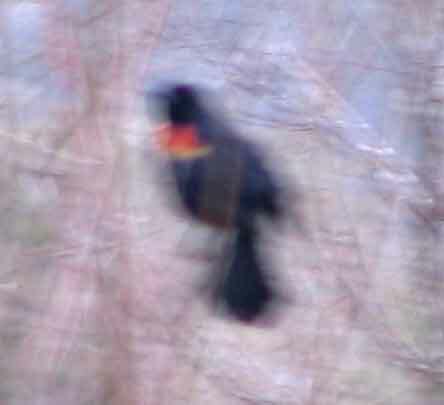 Another first, a red winged blackbird at the swampy area near the pond. I haven't seen a beaver yet, but there are lots of new cuttings in the swampy thickets near the pond, so they are there and building something. 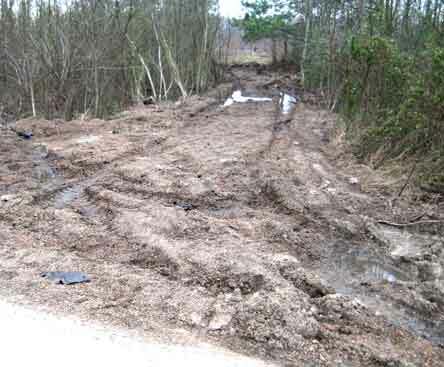 The brush cutting machine had torn up the path to the pond. Why they don't hire two stout fellows with machettes and kaiser blades is a mystery. They could do the job as well without the terrible mess. Well, here's a month worth of things I'm finally getting down to recording. At least one weekend was so cold and windy I didn't get out at all. Spent the time well, though--did the taxes instead of waiting until October. Despite some nasty cold fronts there really was a lot going on. As you will see. February 14, St. Valentine's day, we got a really heavy wind storm. It blew my little wind vane down. It blew trees down on power lines and broke off tree limbs all over town. 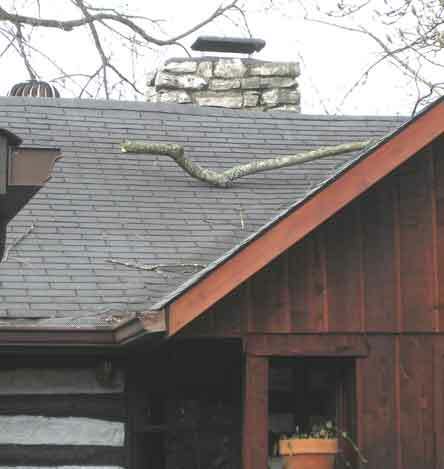 We lost some shingles and had this large limb slam down on the roof. 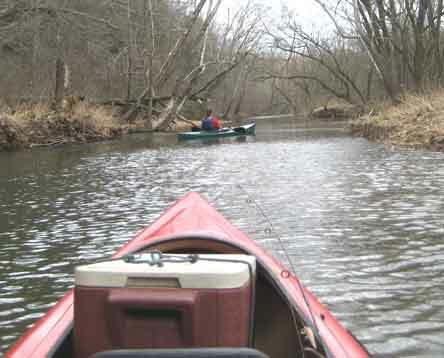 Sunday, February 15th, Harry and I took the kayaks to Fall Creek on PP Lake. Water was as low as I've ever seen it. 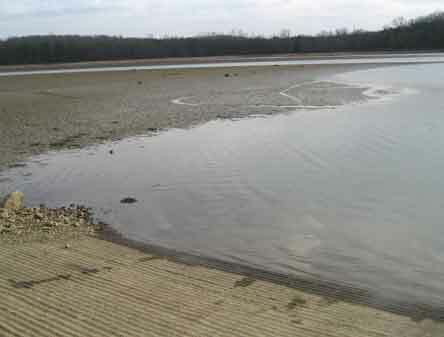 That's a mud flat where you could normally run a large boat. These three guys put in just before we did. 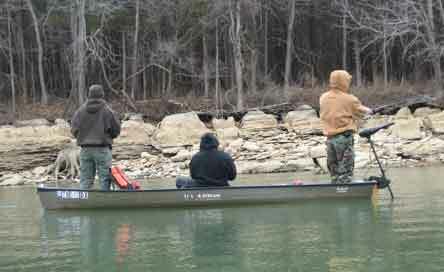 They fished hard and were still at it when we left. 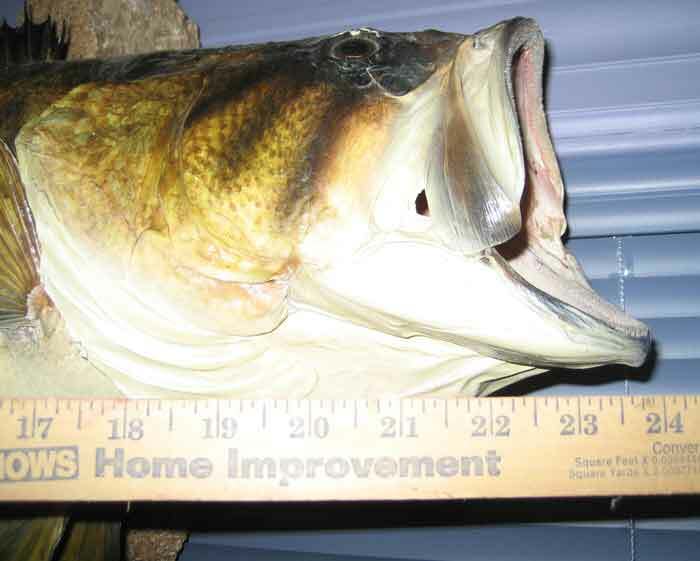 Never saw them catch anything. 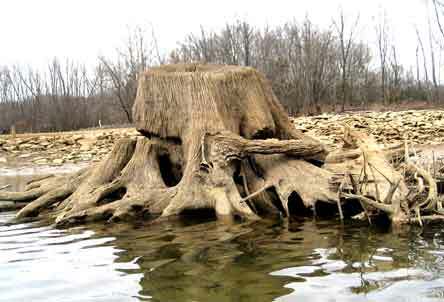 This stump is usually just above water or even fully covered. 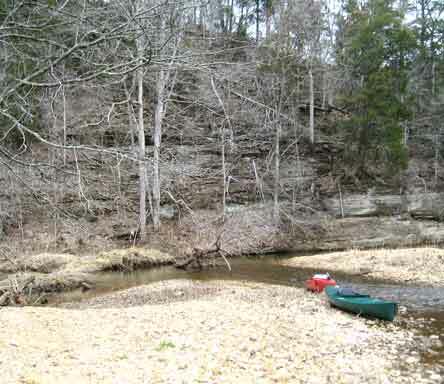 When we got a quarter mile from the 840 bridge we had to portage past this shallow run. 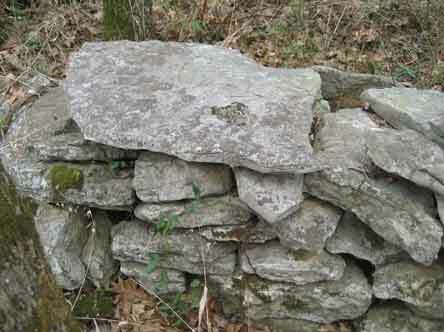 We walked around a bit to stretch our legs and found this dry rock wall running back into the woods and up the hill. Love to have these at home. Another run we had to wade through. There were four or five before we finally gave up and came back. Nice day to be out though. Not too cold. Monday, the 16th, was President's day so I was off work. Sherry and I went over to Bell's Bend Park because Judy Luna had reported several woodcock sitings. It was cold! We walked down to the barn way across there. The idea is to see the male woodcocks do their strange courtship flight and song. 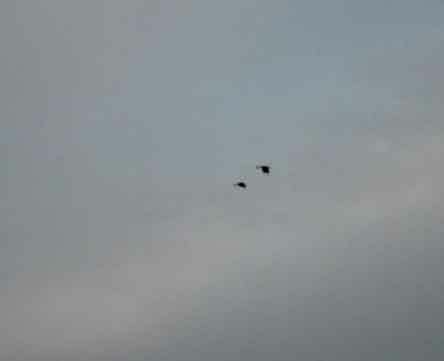 We did see three, or Sherry saw three and I saw one, but only flying by. We stayed until the last bit of sun set and then went home--freezing! 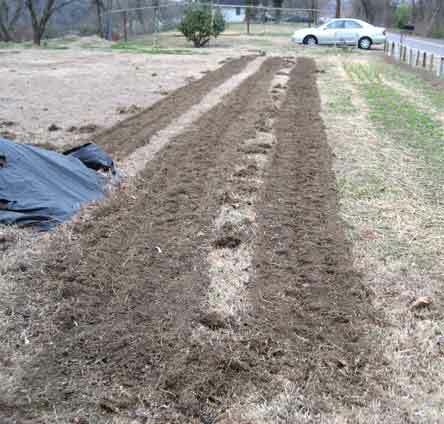 Earlier Monday I plowed up a row at Travis' house. Planted peas, chard, beets, and mesclum mix of lettuce. Hope the peas will climb the low fence here. 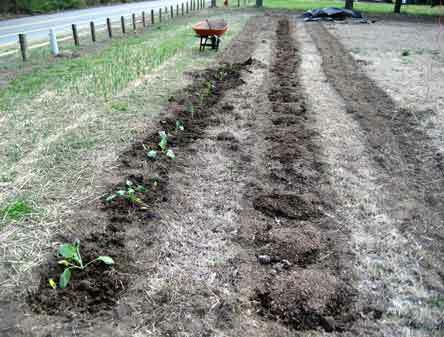 I also tilled up the row behind the trellis and planted snow peas and sugar snaps. Thursday I walked at SB early and it was cold. 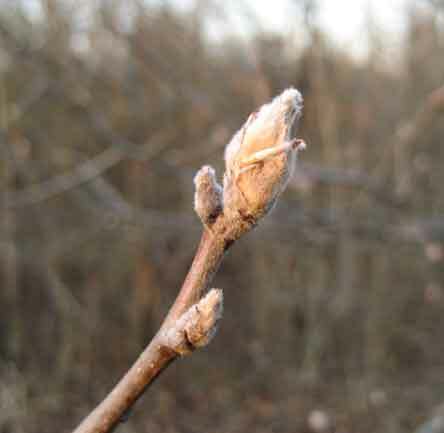 Still this tough bud was getting ready to open despite the frost. At this time the sun was coming up around 6:00 so the last part of the walk was not so chilling. It was still standard time. 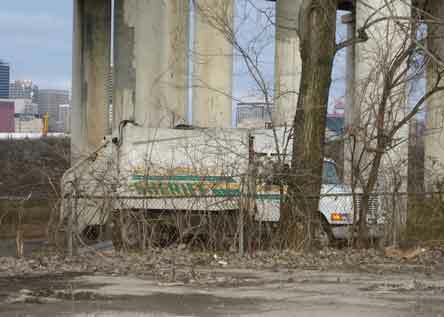 On the way to the YMCA after my walk I saw the sheriff's men with a huge garbage truck and 8 or 10 prisoners tearing up the homeless camp under the interstate bridge. I let Joe, the camera man at Channel 2, know about it when I got to the Y. He said they got there too late to get anything. It's a real shame that we feel the need to take away the few things these people have. 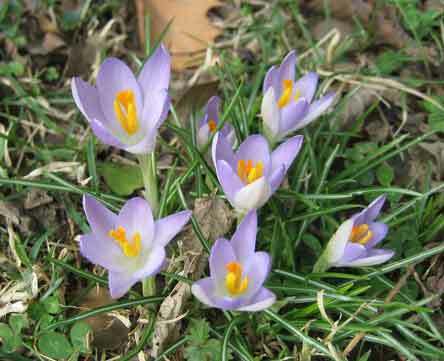 Saturday it was not so cold and the little crocus blossoms began to open up by our front door. A good sign of Spring that cheers us up each year. 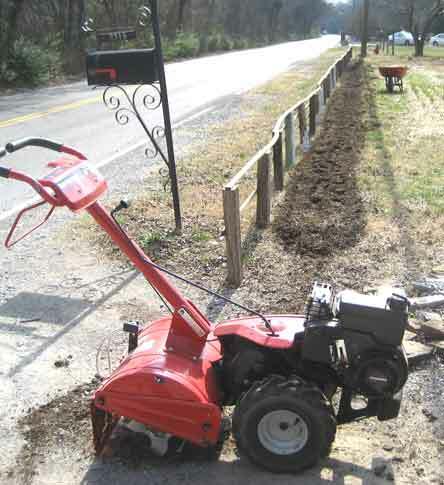 I wanted to take Dave's tiller back, so I tilled up three more rows Saturday morning. Rain was forecast but missed us. 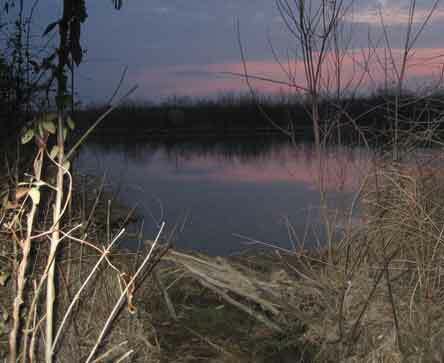 Tuesday it was raining so I didn't go to Shelby Bottoms. 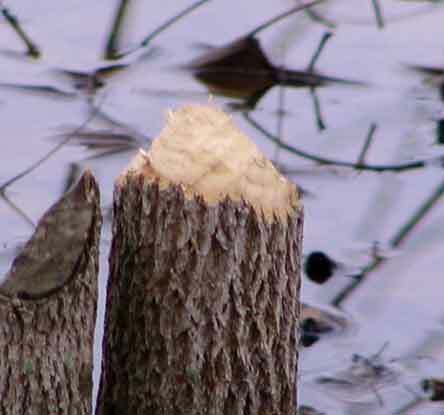 Thursday I did and found that the beavers has worked on raising the level of the dam at the corner where it drains. 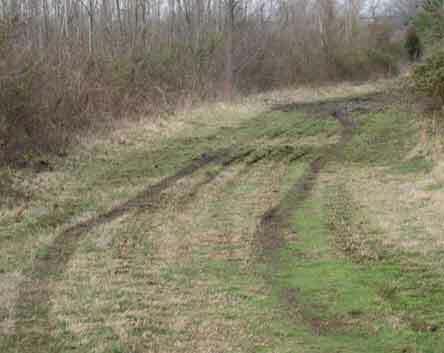 The brush cutting machine they use to keep the paths cut back plays hell with the dirt paths. Big ruts and potholes full of mud everywhere. Saturday, March 7th, last day before DST. I planted a lot of stuff. A neighbor gave me three cabbage plants. I didn't notice until I was planting them that they were supposed to get huge. That's a baby inside one. Oh well, I guess we can pull them somewhere short of 50 pounds. No wonder he gave them to me! OK. 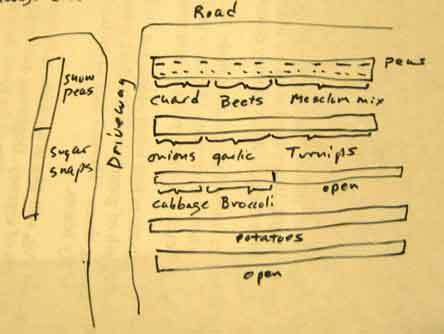 Here's a chart of what is planted at Travis' house so far. Good to have this so we can check next year. You can check the chart and see what is what. 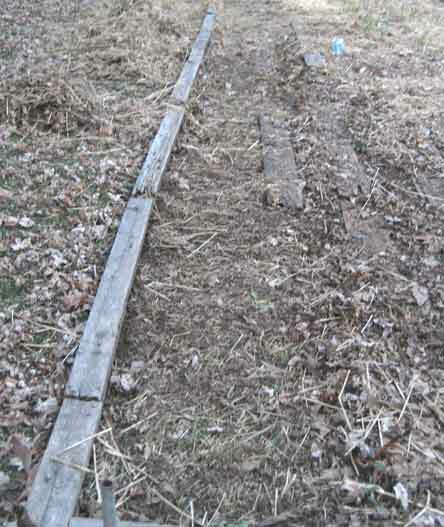 The second row from the road with the onions, garlic, and turnips was planted last fall. The half planted row is the cabbage and broccoli and the fully planted one is three kinds of potatoes, something new I'm trying this year. We will see. 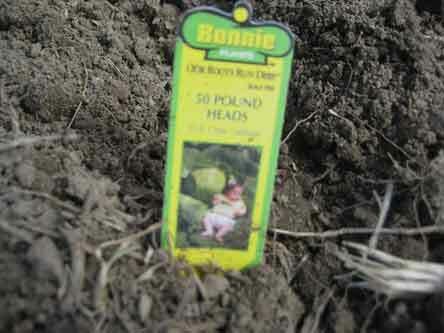 There is another one available for whatever else we want to plant after it warms up--tomatoes, okra, corn, beans, peppers, egg plant, squash, cucumbers--all that good stuff. 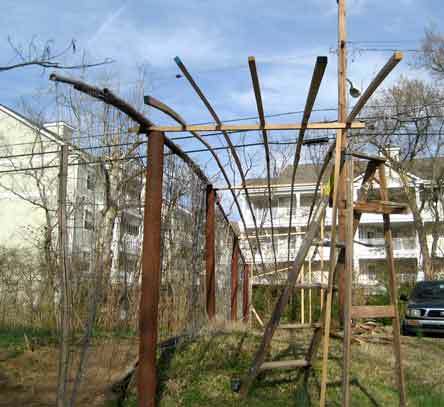 Saturday I also extended the trellis with these wooden poles I got from the furniture factory scrap pile. 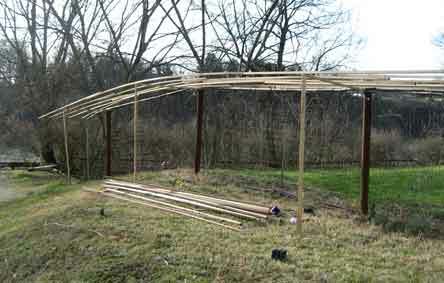 They work fine and the ones left over will make good tomato stakes. The reason for the extension is so I can walk under the vines instead of having to lift them up when they get to the top of the old lattice and start to go over the other side, like they did last season. 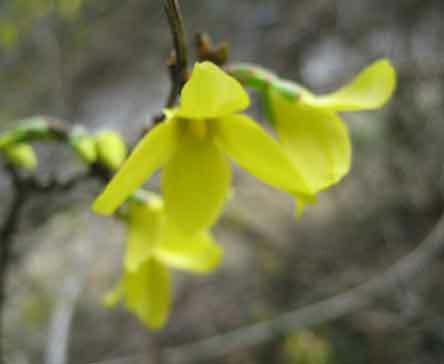 Two more sure signs that Spring is near--the forsythia is popping out... ...and the Japanese magnolia is too. Of course this is the third try it's made. The first two got frozen out but this one is working. Good job old tree! 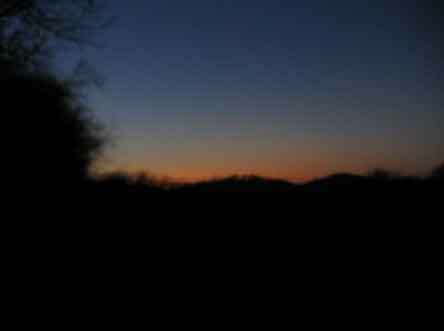 Sunday was the first day of daylight savings time. 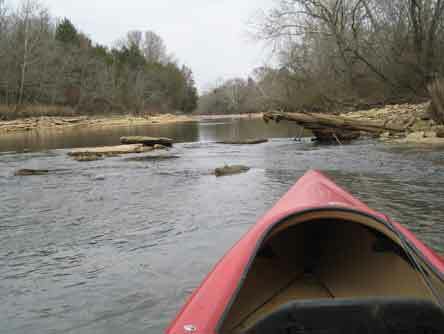 It was really windy, but not too chilly so, despite predictions of rain storms in the afternoon, Harry and I took the kayaks up a creek that runs into the Harpeth River. 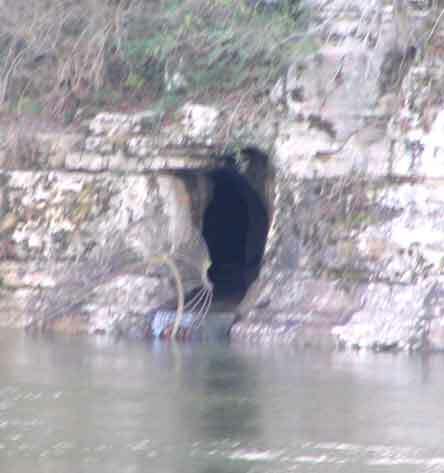 It's a great creek with some spooky areas. 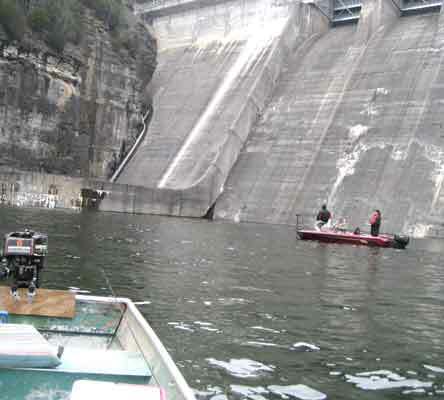 Couldn't get any higher upstream, so we stopped and took a leg stretch break. This plant with the tiny flower was growing out of the gravel bar. You can see it in the photo on the left. 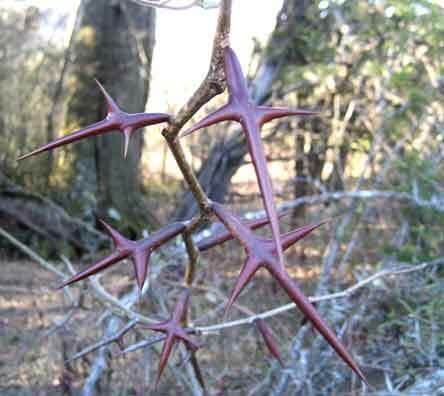 That is one tough plant. Susan Stahl says it is probably Star Chickweed. 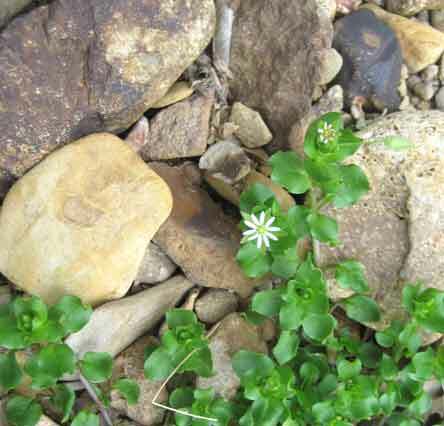 But it could also be Common Chickweed. 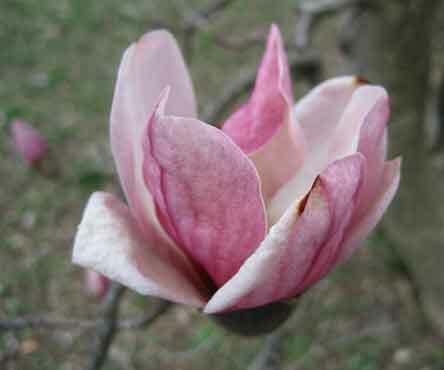 The wildflower book says the leaves of that are considered a delicacy in Europe if harvested early, before it flowers. So, there you have it! 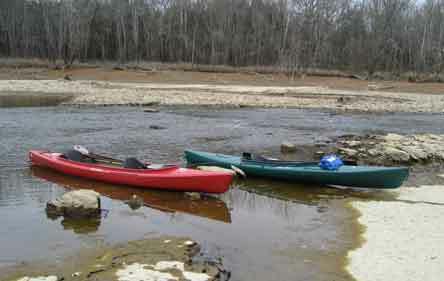 On the way back down the Harpeth we got a real thrill. 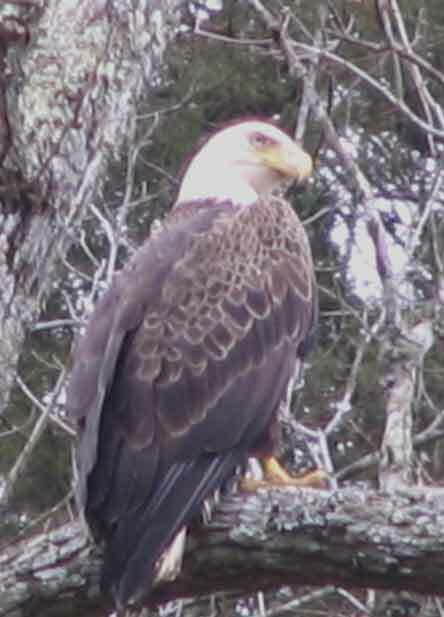 A bald eagle. He let us get close enough to get a nice photo although the wind and the waves made it a little hard to keep him in focus. What a day! Well, lots of cold, cold weather--down to 3º one night and under 10º for several others. But then, last Thursday it began to warm up and the weekend was almost shirt sleeve weather. 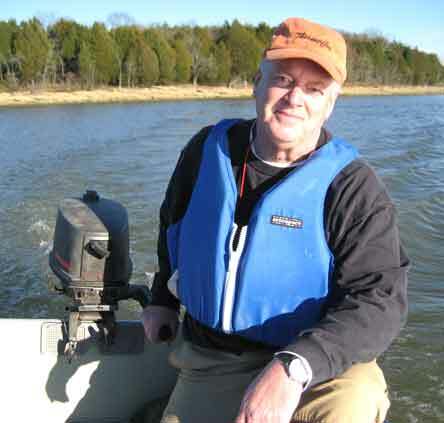 I haven't done much fishing. Torn rotator cuff muscle won't let me do much. 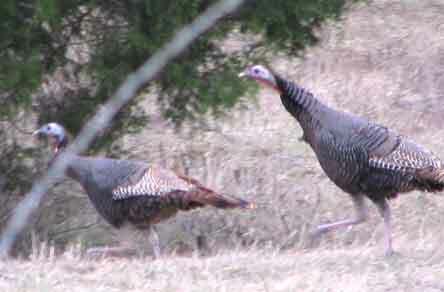 I did walk around the turkey patch a couple of weekends and enjoyed that. I've discovered the video function on the cameras and have a new one for you this time. Major disappointment--I checked the turnips today and found that the straw covering had smothered them. Good thing I planted more at Travis' house. The ones there braved the frost and are still doing well. Lesson learned. Just one more in a long line that probably won't ever end. 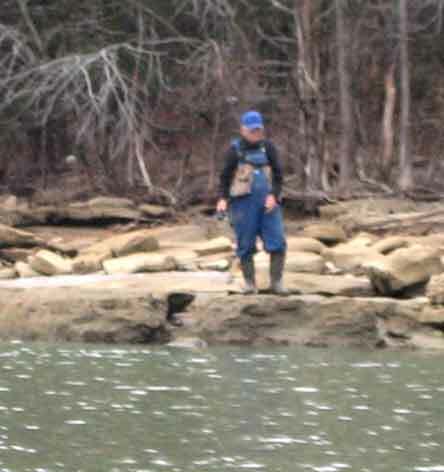 December 29th, Thursday at Shelby Bottoms and very cold. Beautiful dawn, however. 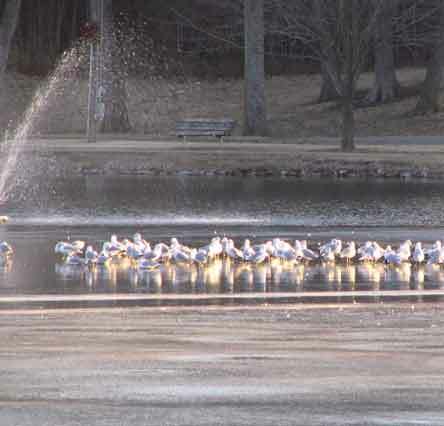 Gulls evidently like to take a break on the ice at Shelby Park Lake. 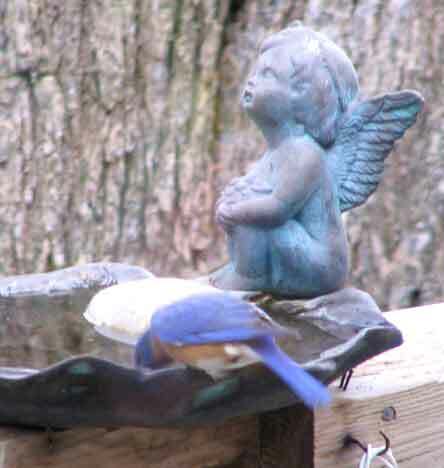 The blue bird came back to sample the water. It was warming up around this time. Tuesday, January 27th. Big surprise at SB. 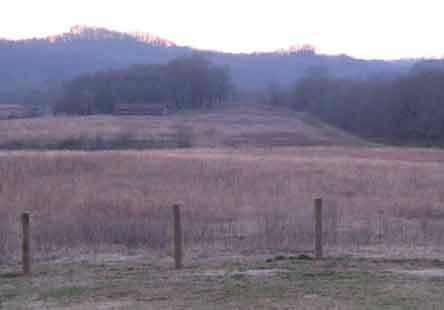 They bush hogged the two big fields near the pavilion. That is good. Now I can watch the deer in the grass. 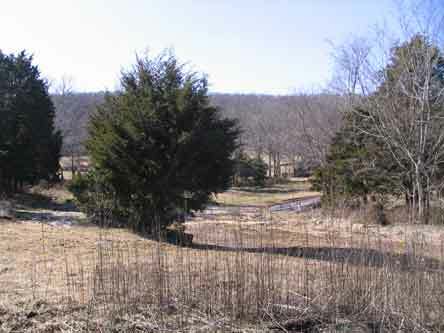 The brush and little trees would soon have hidden them. 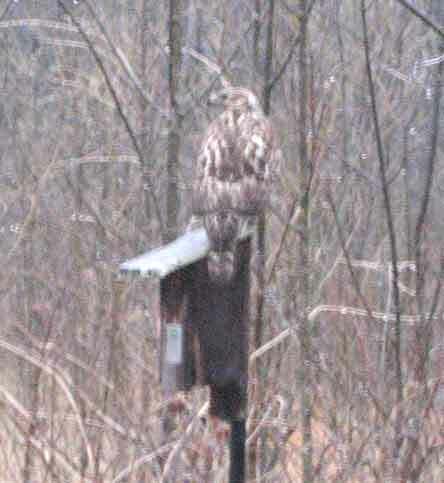 Big hawk on a blue bird box. January 31st. Cold and clear, but windy. 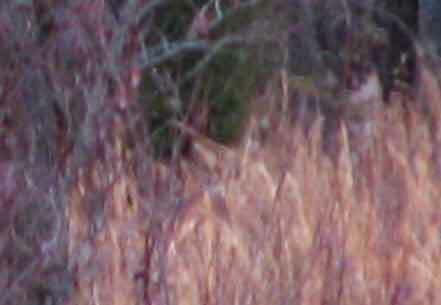 Saw two deer from my turkey hide. Yep. There are turkey signs everywhere. 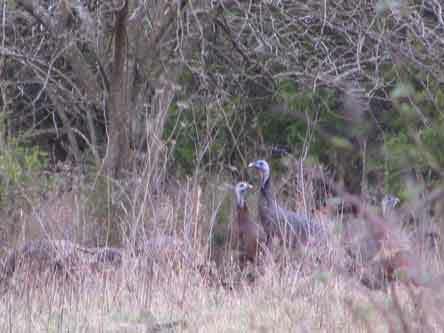 Not long after spotting the deer two turkeys flew down from the hills and plopped down close to me. One got spooked, but the other one kept calling, "Puck...Puck...Puck..." as he cautiously paced back and forth. Finally, he gave up and disappeared down the hill into the cedars. A week later and the weather is really nice. Beautiful farm and beautiful day. 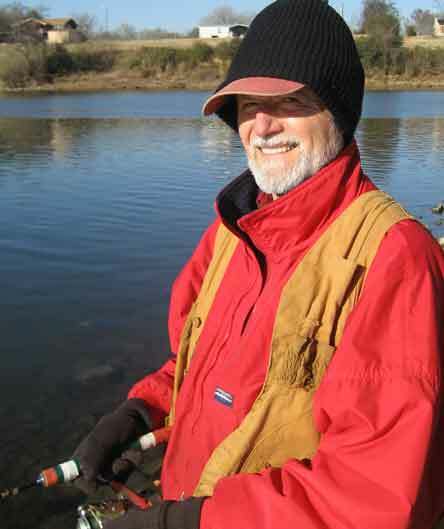 I took a fishing rod to try for the catfish in one of the ponds. Just as I came over the top of the dam I saw this pretty doe who posed nicely for me. I put out my fishing rod and waited to see if any fish would bite. I was using corn and nothing was interested. I was told worms were the bait of choice here. Oh well. 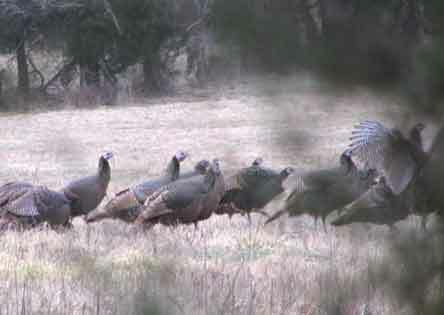 While I waited inside my blind for a fish to bite I called turkeys and six came from across a large field. Here's the video of it - Click Here Sunday I stayed in and caught up on the web sites, even though it was a beautiful day. Have an ear infection that is making me a little off. I did go outside long enough to rake the straw off my turnips planted last fall. They all died. Not enough energy to replant them today. Maybe next weekend. Well, lots of stuff, but mostly birds again. I guess this time of year everything else stays put if it can. 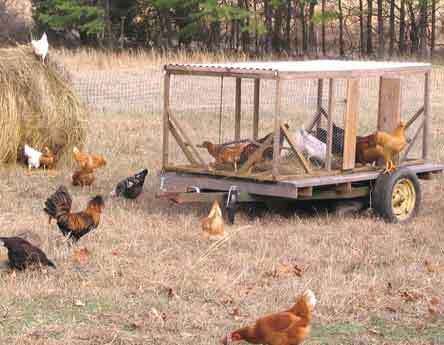 The birds have to be out and about making a living. 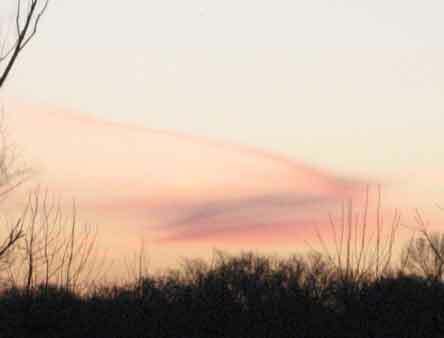 Check out the photo below shot today (January 19th) out the den window. 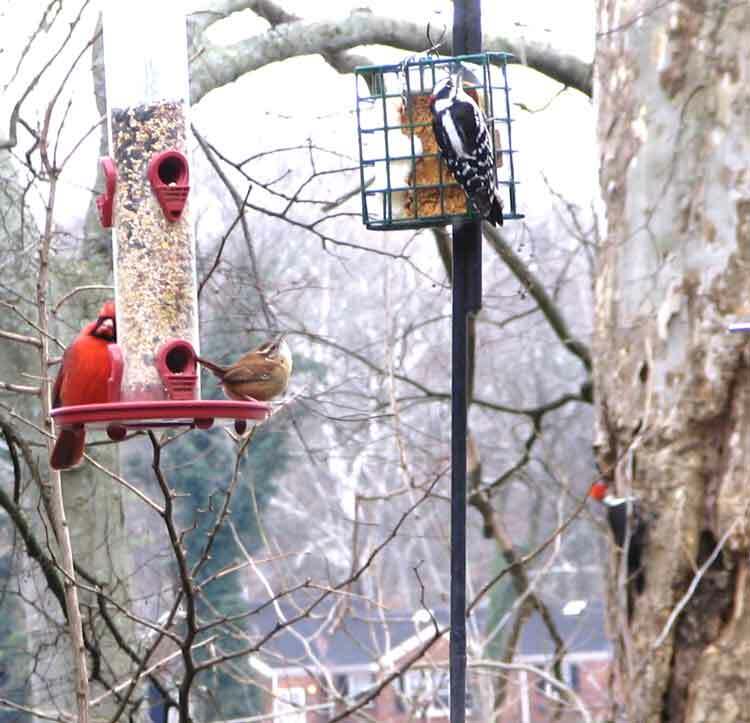 Four nice birds--cardinal, wren, and downy woodpecker on the feeder and the big piliated woodpecker on the poor old sycamore tree's wounded side at bottom right. 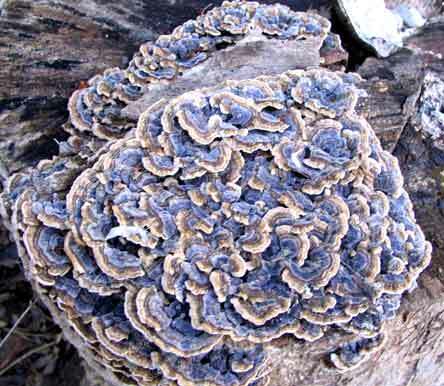 Thursday at Shelby Bottoms and water is gushing from the big storm sewer opening in the cliff across the river, Beautiful fungus on a downed tree near the river bank. I followed this hawk from perch to perch before it gave me a decent shot. 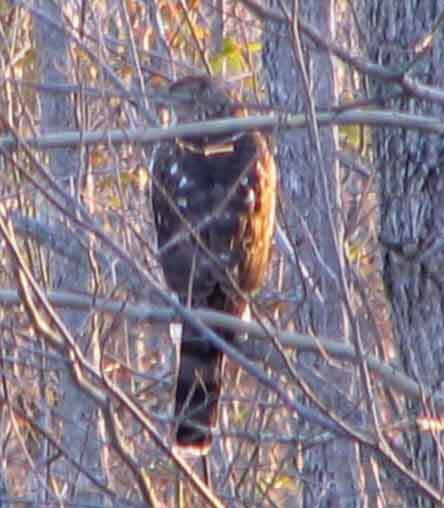 From the squared off tail I think it is probably a Coopers Hawk. Friday afternoon as I was changing clothes after getting home from work I caught Hootie peeking out of his house. 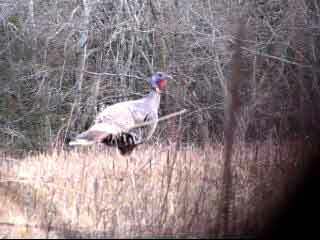 Hope he raises a family again this spring. It is always exciting to try to try to get a look at the young ones before they head out for parts unknown. 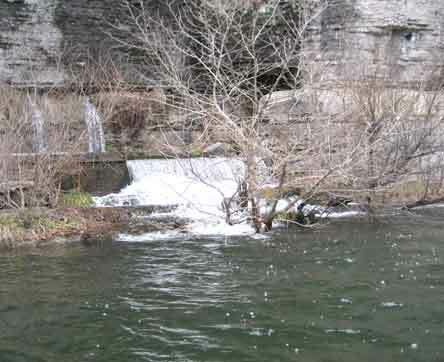 Saturday I went up to the pool below Center Hill Dam. It was cold and they ran two generators all day, so the water was very high. Water is usually falling 12 or 14 feet to pool level from that third ledge that is just barely out of water. I fished deep and hard, but caught nothing. Had a small brown on briefly, but even that got off at the boat. There were two other boats out that day, but none of us caught diddly. 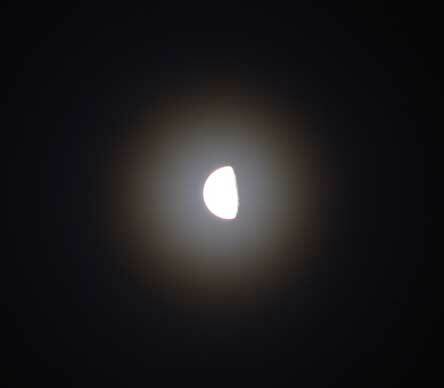 Very early, so the light is dim and this is a very long shot. But there are two bucks to the right of the bushes. 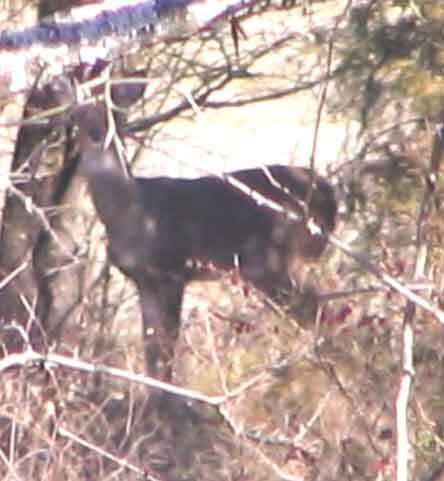 I could see them both clearly with my binoculars and they both had big racks. Won't be long before the momma deer will be showing the little ones around. 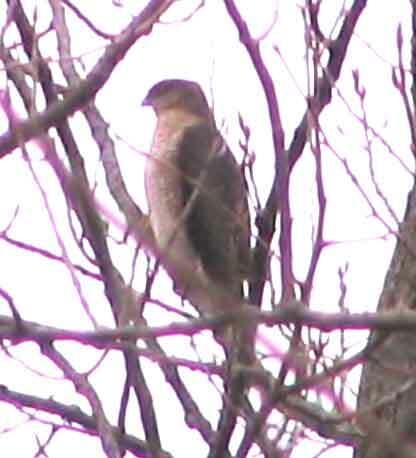 Got another shot of a hawk this morning, just before it began to rain. Couldn't tell what kind it was, except that it was big. Saturday was cold, but dry. 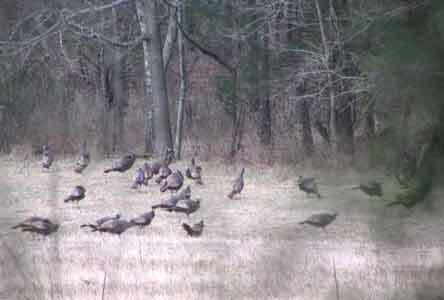 So I went to try to find some turkeys. 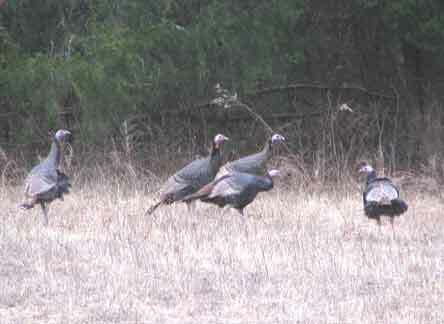 These five toms came right up to my blind and almost came inside with me. I guess they thought there was a love sick cutie there. They caught a movement however... ...so they beat a strategic retreat. Hope to see you again, big guys, this Spring. I saw birds way across the field and managed to slip and crawl to a spot ahead of them where I could watch. It was like a river of turkeys. 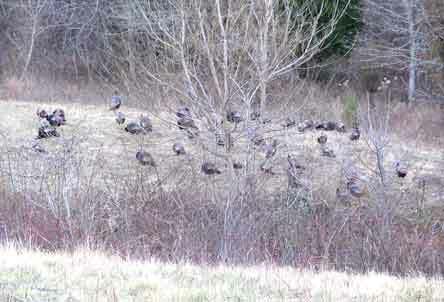 They moved slowly across in front of my cedar trees like an army in line. 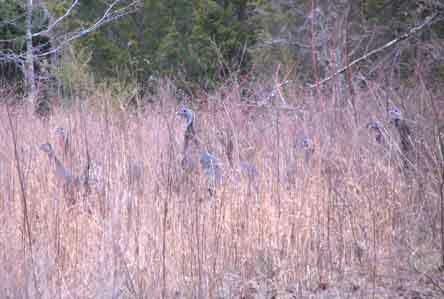 When they got to the far side of the field near the creek they began to slow down and more joined them from the woods. There must have been over 100, and probably more. I finally remembered I had a video function on the camera. Click Here to see the video. It gives some idea but it still does't come close to showing the hugh numbers of birds that were there..
Today is Martin Luther King Day, so no work. 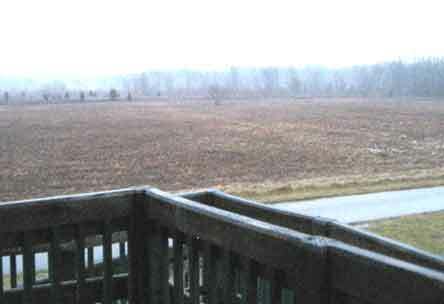 Cold and wet outside with snow that won't quite stick. Stayed home all day to work on the web sites. 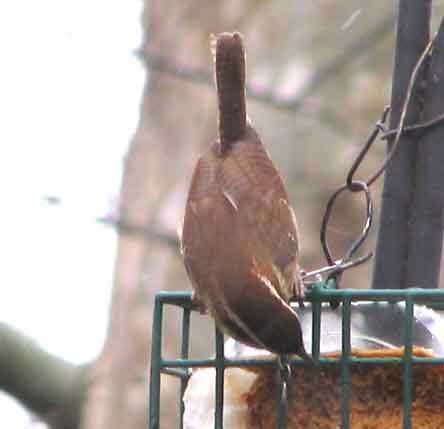 Also shot photos of birds on the feeder while entertaining the grand child. 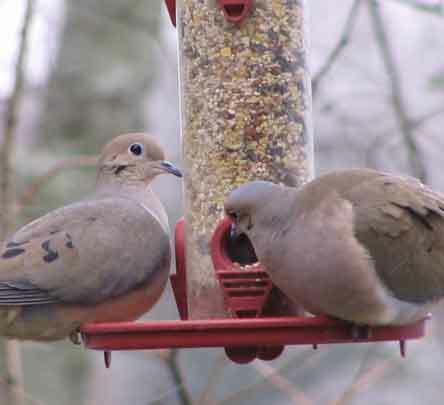 These two doves are too big for the little feeder tray. All the birds like the peanut butter. I have to fill it twice a week. This little wren and his mate are regular customers. I don't know what this one is. 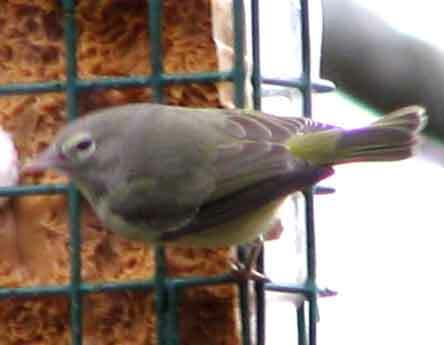 Suspect it is one of those confusing warblers. Have to ask Judy Luna. 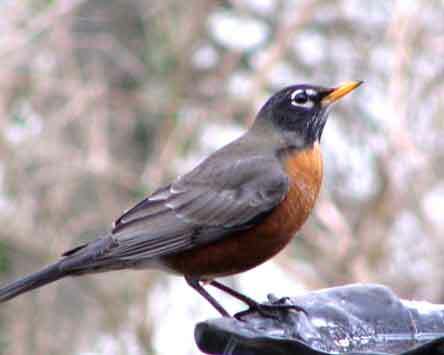 The robins and blue birds don't care for grains, so they don't frequent the feeders. They appreciate the water, however, so I try to keep it thawed. 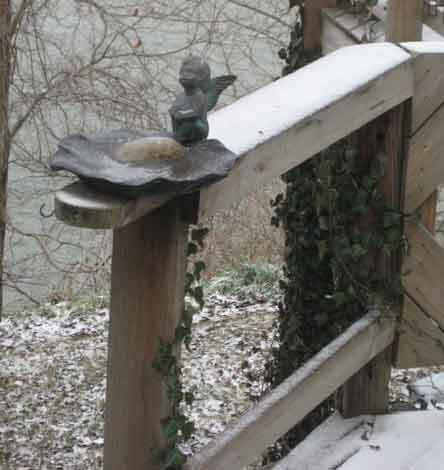 We had five blue birds gathered on it today. Before I got the camera out, of course. 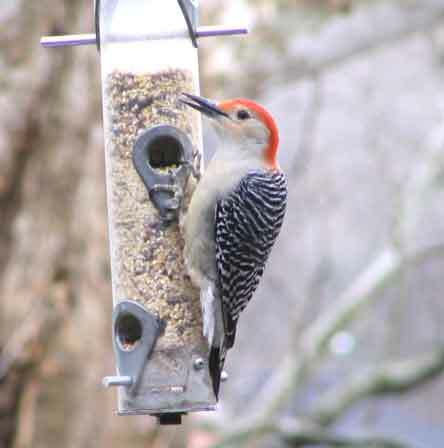 The red bellied woodpecker likes the seed and I haven't seen it on the peanut butter at all. 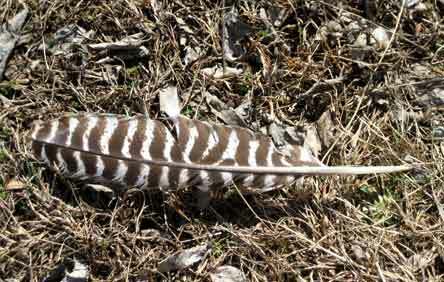 The downy and hairy woodpeckers will eat some now and then, but they mostly stick to the peanut butter. 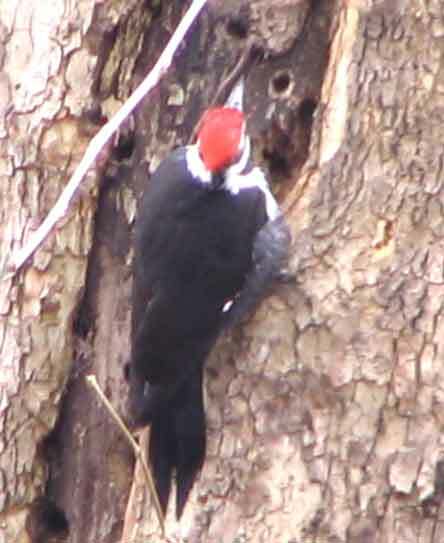 The piliated woodpecker is really working on the injured side of the sycamore. Its nest is higher up, but I think he's working on a new one here. Well, I guess this one is all about birds. Winter began with me visiting my friend Ed with the idea of walking around hoping to take photos of turkeys. 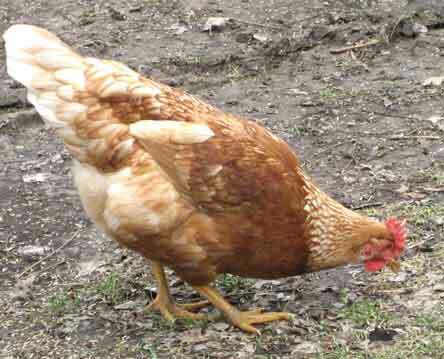 While there I bought a chicken and two dozen eggs from Ed's daughter, Karen, who is raising free range chickens. 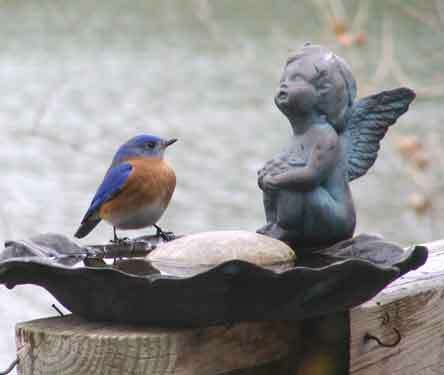 Then, just yesterday, we looked out and saw a bluebird on the bird bath. Then several more. 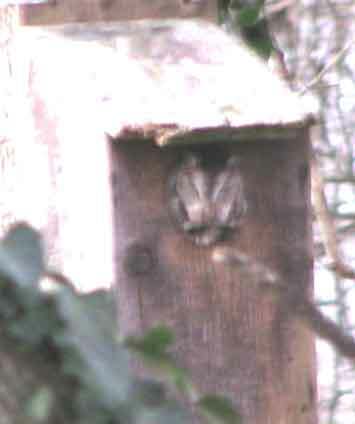 And this morning I saw two blue birds checking out the owl house as if they were thinking of moving in. Well, since I saw Hootie in it the day before I doubt they will want to share, so before heading off fishing I put one of our empty bird houses out in the back. Hope they will consider moving in. We will see. 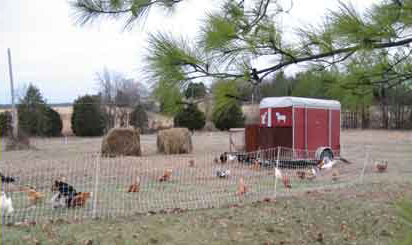 Karen has a movable electric fence and a movable roost for her chickens. There are all kinds. She told me the names but I forgot. She is going to send a list, so I'll add the names when I get it. 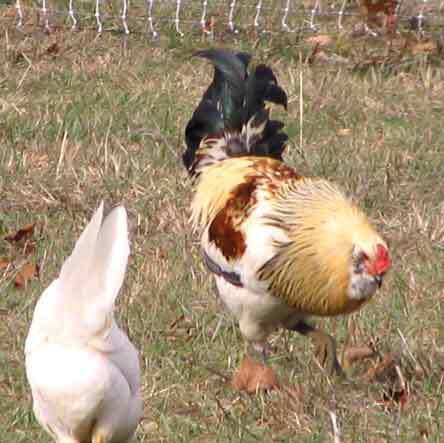 This big rooster is an American Rooster with one of his Pearl White Leghorn girl friends. 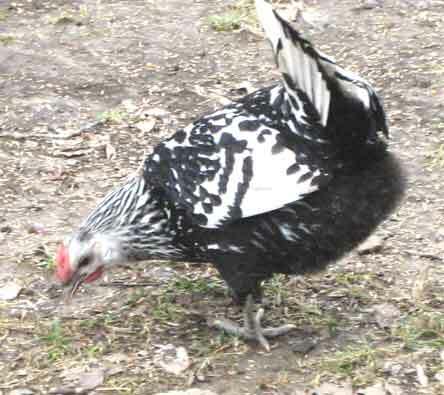 Nice pattern, girl, for a Silver Spangled Hamburg , that is. 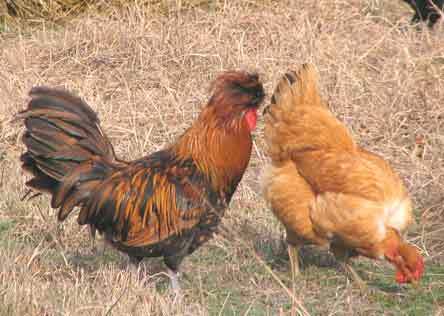 Golden Bearded Polish Crested Rooster and Turken/Transylvanian Naked Neck Pretty is as pretty does, as this Hubbard Isa Brown hen always says. 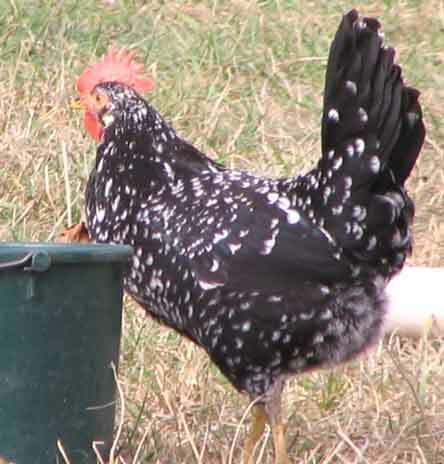 This Ancona hen, originally an Italian bird and a white egg layer, is quite nice looking and she seems to know it! 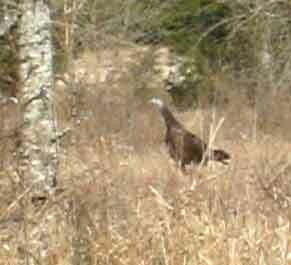 I set off into the woods and fields looking for turkeys. 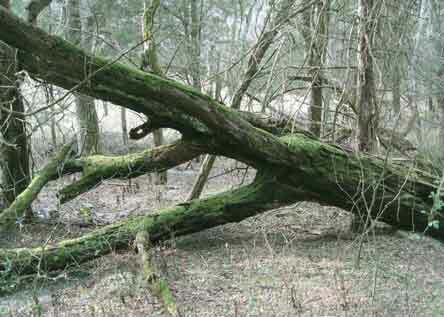 Saw this interesting downed tree covered with moss.  Notice the hole in the limb at left center. The hole in the limb made a nice frame for the trees and field beyond. 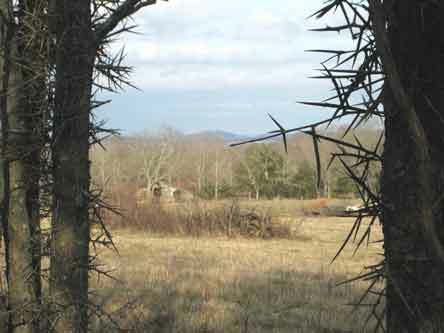 I set up in my blind behind some cedars and thorn trees looking across the big field back toward one of the barns. I called, but nothing came for almost an hour. Then I heard some calling off to the south so I packed up and walked again. I saw this flock about the time they saw me. 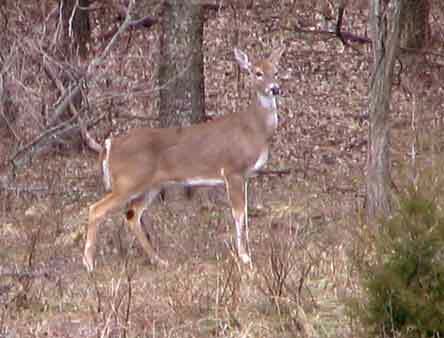 So they are fast disappearing up the hill and into the woods. 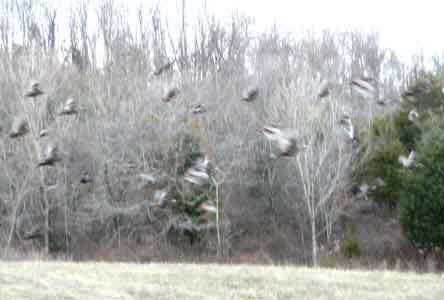 On the way back to the car I saw this flock of maybe 20 birds. As long as I stayed frozen they kept an eye on me but continued moving slowly and feeding. Most of them are feeding across the field, but there is always one or two keeping an eye on me. Finally I moved up a few steps and they all flew away. 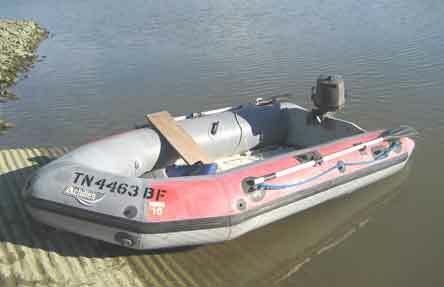 This is the Achilles inflatable and 4hp motor Harry bought. We took it out for a spin on Sunday. Beautiful day. Warm, sunny, and a perfect calm. Everything worked well and Harry seems pleased. 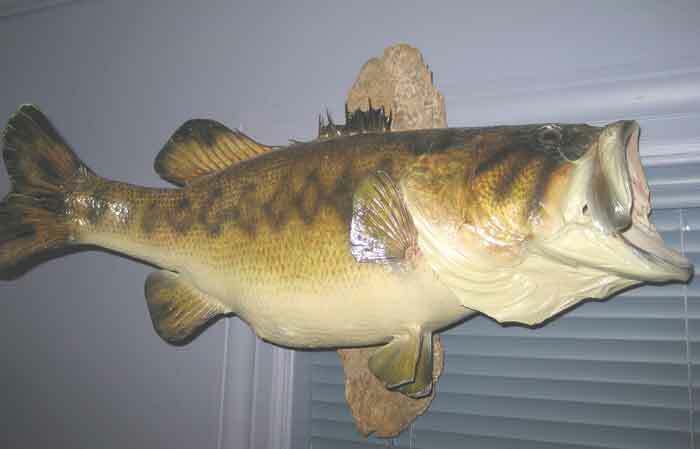 The Episcopal thrift shop had this huge mounted bass for sale so I bought it. I'm just waiting for the perfect opportunity to give it as a gag gift. It will come. Tuesday morning at the pond at SB. Pretty chilly and calm. 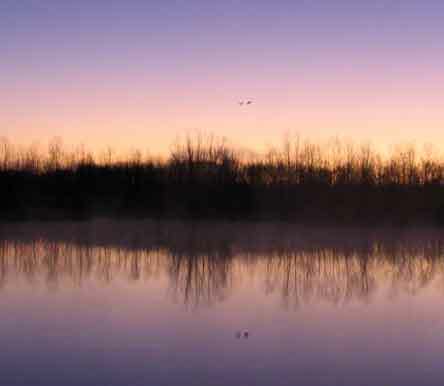 Two ducks got nervous and flew off shortly after I arrived, just before sunrise. This is Bee and his girl friend, Helen. 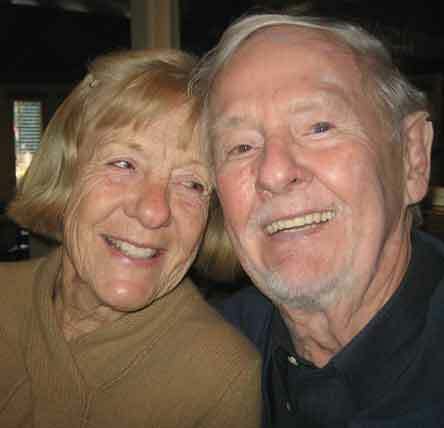 She is visiting from South Carolina where they met when he was a pilot during the second world war. Bee is one of the regulars at Chili's where Harry likes to hang out. If only all of us could keep our health and spirit as young as Bee and Helen have. Cheers! 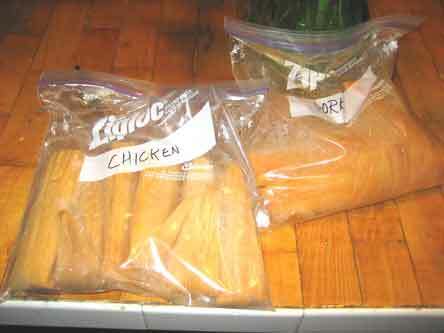 The reason I met Harry at Chili's was tamales. He located a Mexican lady who makes them and got me a dozen. Six chicken and six pork. We ate them with the kids New Year's Eve. Excellent. What a great resource! 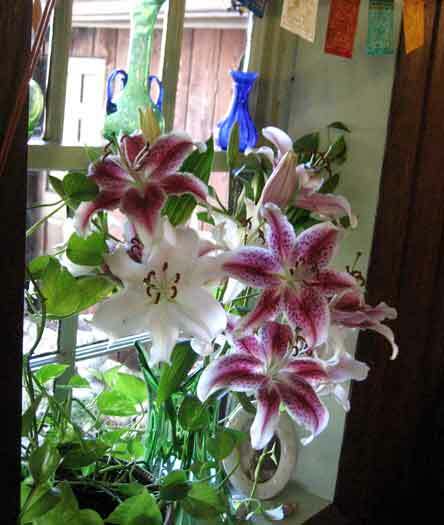 Sherry decorated the front window with these beautiful lilies. What kind of life would I lead without her? Probably have a house full of empty beer cans, dead fish on the walls, and dirty clothes on the floor. Thanks sweetie! Since I was off New Year's day and it was absolutely beautiful I decided to go back to see if I could get some more turkey photos. 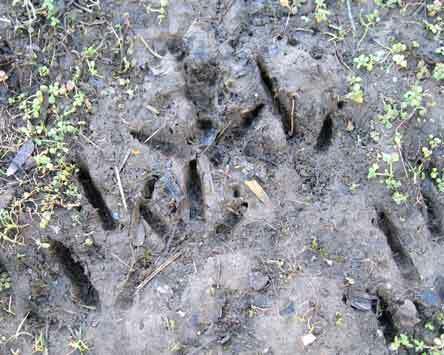 There were tracks everywhere after the recent rains. 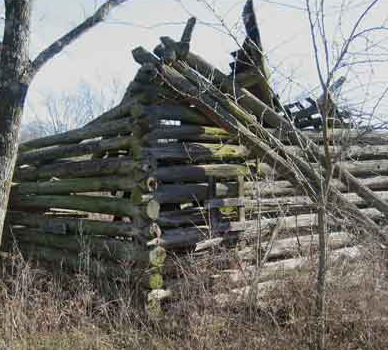 Some of the old buildings on the farm were built many years ago. One of the reasons you need to move slowly and watch where you step. 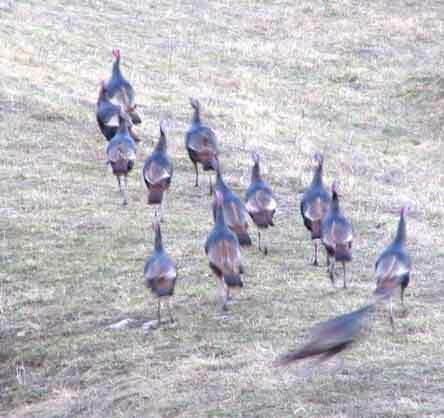 Coming around a bend in the trail on the side of the hill I saw these gobblers. There were 7 or 8, all males. 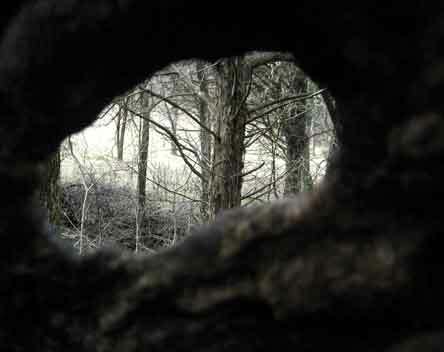 They knew I was there, but I kept behind a cedar tree and shot through the branches. They finally moved into the woods. I took a hide high up the side of the hill and called for about half an hour. Finally I left and suprized these fellows who were drinking behind the dam of the middle pond. I was very close when we saw each other. First they ran but shortly after I got this shot they took off. 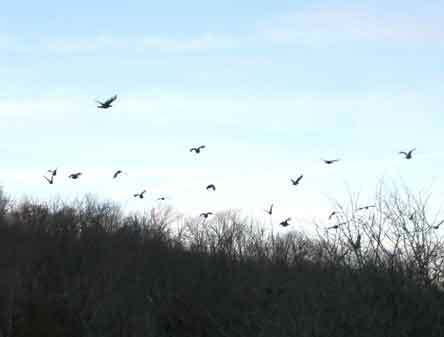 Late in the afternoon I saw this large flock heading for the pond. 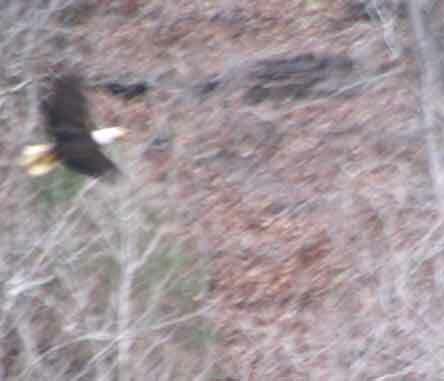 I circled through the woods and got several good shots. 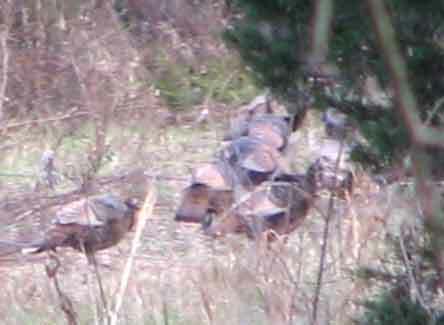 This is only about half the turkeys in this group, the others are still coming from the brush on the right. I crept closer and closer, but finally the alarm was given and they took off. Must have been between 50-60 birds. Maybe more. They don't fly often, but when they do they can really make time. 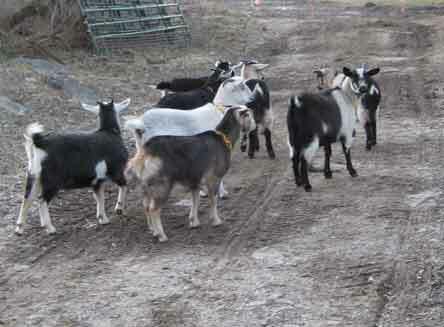 Almost back to the house and this flock of goats followed me to the gate. I guess they were hoping for something tasty. Sorry. Maybe next time. 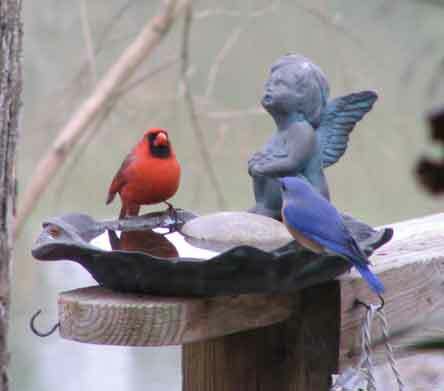 Saturday morning and several blue birds visited our bird bath. Two of the most beautiful birds around. Wonder what they are thinking? "Hey, Red, I was here first!" Yeah, but I'm bigger. Scram." 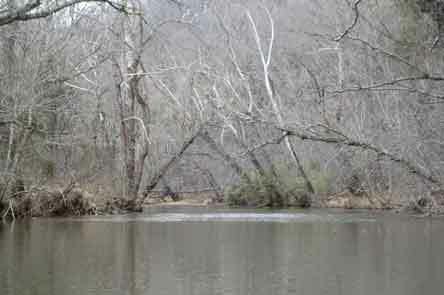 Saturday afternoon I tried Fall Creek for crappie, but caught only 9 or 10 small bass. Another old timer, even older than me! was trying his luck as well. 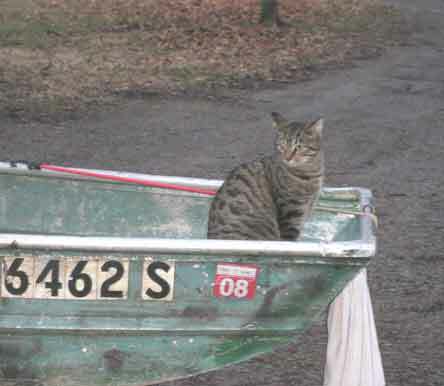 Stopped by Ed's farm to get more eggs and Maytag, his cat, decided she wanted to take a ride in my boat (it's sticking out of the back of the truck). Or maybe she just smelled the faint odor of the little bass I caught and let go.